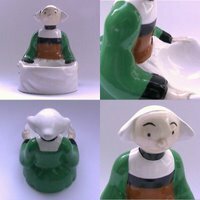 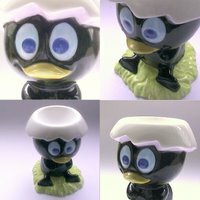 The French company Tropico Diffusion sells a wide range of products featuring famous characters and registered marks. 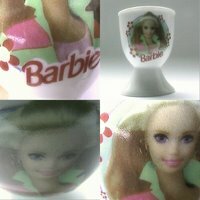 And it looks like they love to use their licenses to create figural ceramic egg cups. 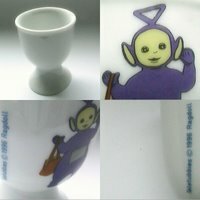 Actually, they did produce at least one footed (non figural) egg cup a long time ago, but over the years they have been specialising in figural ones, with a recurrent tendency to explore the possibilities of having the famous character next to some object where the soft-boiled egg can rest. 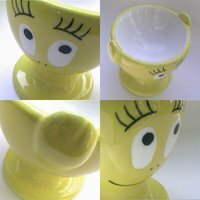 All in ceramic, yes. 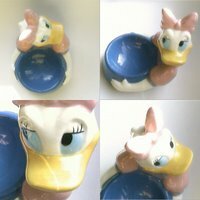 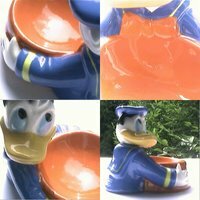 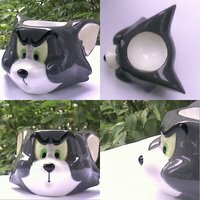 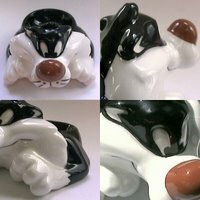 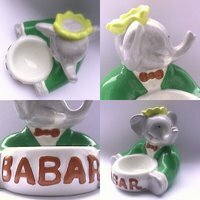 Known details: 1) Sylvester The Cat, 1996 [eggcup2444]; 2) Donald Duck [eggcup2020]; 3) Daisy Duck [eggcup2021]; 4) Barbazoo, from the Barbapapa family, also known as Barbayellow [eggcup2627]: 5) Bécassine [eggcup1397]; 6) Babar [eggcup2627]; 7) Tom [eggcup2615]; 8) Jerry [eggcup2616]; 9) Calimero [eggcup1786]. 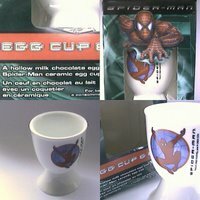 If you like egg cups with famous characters, which, to say the truth, can get quite collectable, please refer to the Famous characters: transfers post; you will find there egg cups featuring i. e. Twinky Winky, Barbie or Spiderman.